Is Wicca modern-day witchcraft or just a harmless collection of customs that respect nature? Does the Bible indicate if we should observe Wiccan holidays? "Wheel of the Year" by Midnightblueowl. Licensed under CC BY-SA 3.0 via Wikimedia Commons. On the surface, many religious practices seem harmless. That is especially true of religious practices that point out our need to respect the natural order of things, such as planting crops, harvesting them, and then honoring our God-given bounty. Many look at Wiccan celebrations this way. But a closer look at the underlying basis for these practices reveals a troubling history. The word Wicca is an Anglo-Saxon word meaning “wise one.” The word pagan is derived from the Latin paganus and means “people of the earth.” The blend of worship that is called by these names seems to have developed among people who were superstitious about the cycle of the year. Would the sun’s warmth return to enable crops to grow? Observing the return of the sun led some ancient farmers to tie their worship into the seasonal cycles. The people thanked the gods of nature for providing for their needs each year, and they supplicated their deities to remember them as the cold winter season descended on their villages. Scott Cunningham, who authored over 50 books on Wicca and New Age religion, wrote the following about the goddess and the god honored in Wiccan practices: “The Goddess chose the Moon as her living symbol, and the God the Sun as his living symbol, to remind the inhabitants of Earth of their fashioners” (Scott Cunningham, Cunningham’s Book of Shadows: The Path of an American Traditionalist, 2009, p. 15). The various celebrations observed in Wicca are called sabbats. Over the centuries, Norse, Teutonic and Celtic traditions met the pagan traditions of the Romans and Greeks and gradually formed into eight festivals. 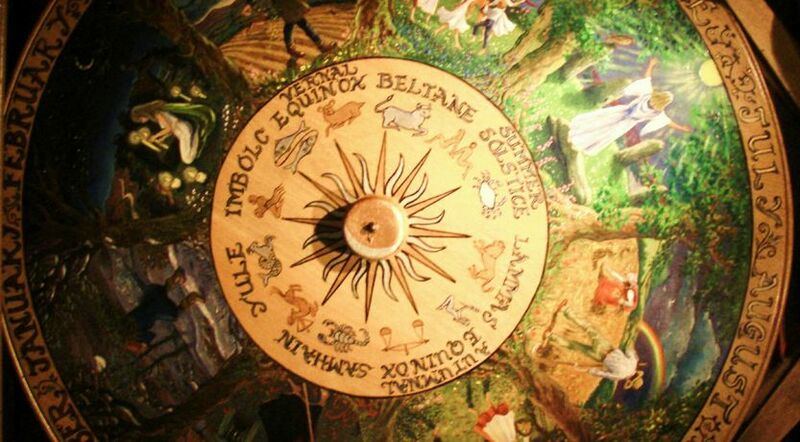 “The eight solar Sabbats represent the turning of the Wheel of the Year, and each honors a stage in the eternal life cycle of the Goddess and God” (Edain McCoy, Sabbats: A Witch’s Approach to Living the Old Ways, 2003, p. 4). These eight festivals honor the sun god as the prime force in delivering light, warmth and, therefore, good crops to the earth’s inhabitants. One of these eight festivals even calls this god, the “god of light.” References to the sun god and the god of light should catch the attention of all Christians, as we will discuss later. These eight festivals are the two solstices, the two equinoxes and the midpoints between each solstice and equinox. While the Wiccan names may not sound familiar to our ears, they have become traditional celebrations in our Western culture in festivals such as Christmas, Valentine’s Day, Easter and Halloween, among others. Quoting again from Edain McCoy, “At [a] time of transition in the Church, pagans went into hiding … and began the task of veiling the ancient folklore and stories of the old deities in nursery rhymes and folk tales. … So when the Church’s distortions, threats, and coercions didn’t achieve the destruction of the old practices, the Church decreed new festivals to coincide with the Sabbats in order to supplant their influence and prominence in the popular mind. It is no secret that the birth of the Christian God, Jesus, was deliberately placed near the time of the birth of the pagan Sun Gods” (McCoy, p. 6). She also wrote, “And don’t be disturbed if some of your [pagan] rituals look vaguely like modern, mainstream, religious practices. Remember that the old ways have been so smoothly adopted by the patriarchal religions and cultures that it is often startling when we analyze their origins. Sabbats were appropriated by the early Church in order to supplant the old pagan holidays” (p. 21, emphasis added throughout). A summary of these eight pagan festivals gives us a clear picture of what is actually being celebrated. These holidays, some of which have been wholly incorporated into today’s Christianity, are obviously tied to the seasons of the sun. Samhain (Halloween): This is the night when the old sun god dies. The veil between the spirit and human world is temporarily drawn aside, and the spirits are allowed to walk on the earth for this one night (McCoy, p. 23). Yule (Christmas): The god who died at Samhain is reborn of a virgin goddess, a mother and child tradition where the sun god is reborn as a baby (McCoy, p. 53). Imbolg or Imbolc or Lupercalia (Valentine’s Day): This festival honors the goddess turning the wheel of the year back to spring, and it honors the growing sun god, now a boy becoming a young man. At this celebration, the goddess is pictured as a bride who will become his consort (McCoy, pp. 87-90). Ostara (Easter): On this equinox, or day of balance, it was believed that the goddess was able to meet her youthful sun god on equal terms and mate with him, becoming pregnant with next year’s sun god (McCoy, p. 110). Bealtaine or Beltane (May Day): Celebrating the spring harvest, this festival honors the sun god as the primal fertility god and consort to the great mother earth (McCoy, p. 123). Summer solstice (Midsummer): Represents the height of the sun god’s power as the hot summer days promote the growth of the fall harvest. This festival beseeched the sun god to produce a rich fall harvest (McCoy, pp. 149-150). Lughnasadh (Lammas Day): This was the sabbat of first fruits of the fall harvest. “Lugh” was the name of the Celtic god of light (McCoy, pp. 173-174). Mabon (Michaelmas): Mabon celebrates the autumn equinox. It pictures the defeat of the old god of light by his alter ego, the god of darkness. The old god of light is waning until Samhain when he will die (mystickaltymes.com). Stripping back all of the folklore that is extant in these celebrations, the underlying theme is consistent—the worship of the sun god, or god of light. In these ancient celebrations, giving thanks for the crops and appeals for the return of warmth in spring are made to the sun, not to the true Creator God. Stripping back all of the folklore that is extant in these celebrations, the underlying theme is consistent—the worship of the sun god, or god of light. In these ancient celebrations, giving thanks for the crops and appeals for the return of warmth in spring are made to the sun, not to the true Creator God. Delving even deeper into this religious symbolism, we see a spirit being other than God. This being was created as “a covering cherub,” a high-ranking angel. His Latin name was Lucifer, from the Hebrew word helel, meaning “morning star” (James Strong, The Exhaustive Concordance of the Bible, 1981, “Lucifer”). Satan, whose name means “adversary” or “accuser” (Spiros Zodhiates, ed., Complete Word Study Dictionaries, 2003), is the corrupted Lucifer. God did not create an evil Satan; Lucifer made himself evil by rebelling against God. God had made Lucifer with free will. Through pride, Lucifer corrupted his character to the point of ruin. He became evil, the enemy of God. God inspired the prophet Isaiah to give us a glimpse into this ancient history. “How you are fallen from heaven, O Lucifer, son of the morning! How you are cut down to the ground, you who weakened the nations! For you have said in your heart: ‘I will ascend into heaven, I will exalt my throne above the stars of God; I will also sit on the mount of the congregation on the farthest sides of the north; I will ascend above the heights of the clouds, I will be like the Most High.’ Yet you shall be brought down to Sheol, to the lowest depths of the Pit” (Isaiah 14:12-15). The prophet Ezekiel was also inspired to write about Lucifer becoming Satan: “You were the anointed cherub who covers; I established you. … You were perfect in your ways from the day you were created, till iniquity was found in you. By the abundance of your trading you became filled with violence within, and you sinned; therefore I cast you as a profane thing out of the mountain of God; and I destroyed you, O covering cherub, from the midst of the fiery stones. Your heart was lifted up because of your beauty; you corrupted your wisdom for the sake of your splendor; I cast you to the ground” (Ezekiel 28:14-17). After Lucifer’s rebellion, God renamed him what he had truly become—a destroyer. God then ordered Satan (and the angels that joined him in his rebellion) restrained to the earth (Jude 1:6). But Satan, never repenting of trying to seize God’s authority and worship, influenced humanity to think of him as the bringer of truth and light. The apostle Paul wrote that “Satan himself transforms himself into an angel of light” (2 Corinthians 11:14). An unwitting humanity was a ready target for Satan’s corrupt self-centeredness. The sun, created and set in its place by the true God to provide light and warmth to our earth, was an essential part of everyday life for humankind. Man’s inclination to worship the sun fit perfectly into the hands of the counterfeit “angel of light.” Sun worship became worship of the god of this age (2 Corinthians 4:4)—Satan! Those who defend the mixing of non-Christian worship with Christian thought argue that this has “Christianized” formerly idolatrous rituals. What does God say about that argument? Is it possible to sanitize pagan worship practices? Does just saying that practices used for sun worship will now be used to worship the Son make the celebrations Christian? God does not leave us to debate the answer. He gave His people clear instructions to avoid other religious practices. He warned them not to “inquire after their gods, saying, ‘How did these nations serve their gods? I also will do likewise.’ You shall not worship the LORD your God in that way; for every abomination to the LORD which He hates they have done to their gods; for they burn even their sons and daughters in the fire to their gods. Whatever I command you, be careful to observe it; you shall not add to it nor take away from it” (Deuteronomy 12:29-32). And God has not changed His thinking (see Malachi 3:6 and Hebrews 13:8). Is your faith the same as that of the first-century Christians—or has your faith been compromised by unauthorized additions? Both history and the Bible leave no doubt that Wiccan practices are not for true followers of Christ. Read more about the practices that please God and those that don’t in the free booklet From Holidays to Holy Days: God’s Plan for You.